Shreya Mambakkam, a resident of San Jose, USA gave a memorable Bharatanatyam performance at the Sankara Matam, Skandagiri in Secunderabad on the 6th of August. 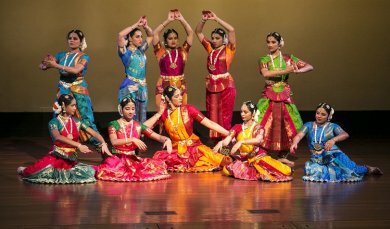 Shreya started learning dance from her mother and guru Suganda Sreenath Iyer of Jayendra Kalakendra USA. 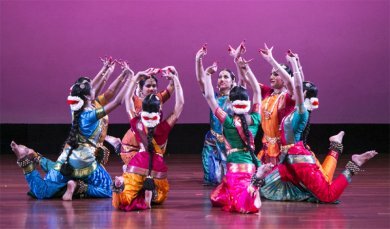 She has also been learning from gurus V P Dhananjayan and Shanta Dhananjayan for the past few years, perfecting this ancient and venerable art form. I saw Shreya’s mother perform when she was 12 and I must say today’s performance took me back to that date. Despite being born and brought up in the USA, I am impressed by the dedication and effort put in by Shreya in displaying the Bhavam, Ragam and Layam associated with each item she presented. Her precise footwork and crisp expressions made each grandmother assembled here to think that it is their own grand daughter performing! Shreya’s grandmother sat with rapt attention soaking in everything her grand daughter did, be it ‘Natanam Aadinaar’ or the crisp Thillana in Kedara Gowla. Shreya’s grandfather beamed with pride as he moved around taking pictures. This performance will remain in our memory for a long time to come. Shreya started with Natesha Kautvam in ragam Hamsadwani and Eka Talam followed by Alarippu in Tisra talam. Alarippu was performed by Kruthi Samhitha Koppullu, another student of Suganda Sreenath Iyer who was visiting India and completed her Salangai pooja on this day. Shreya continued with Jathiswaram in Kalyani ragam and Rupaka talam. Keertanam in praise of Lord Vishnu and Lakshmi was very well appreciated by the receptive audience. The Keertanam was set in ragam Saranga and talam Adi. Natanam Aadinar in the traditional Kalakshetra style followed, drew applause from the audience for her elegant rendition. She concluded her performance with a Thillana in Kedara Gowla ragam and Adi talam.